Romeo Turns Bandit [Roméo se fait Bandit]. Dir. Romeo Bosetti. Perf. Max Linder. 1909. Othello. DVD. Keno Video, 2002. I have not had the chance to see this film in its entirety, but I gather that it takes the tragedy of Romeo and Juliet and turns it into a comedy. 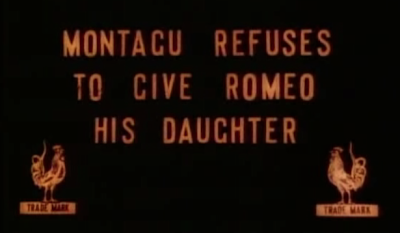 When, as the title card says, "Montagu [sic] refuses to give Romeo his daughter," Romeo kidnaps her (that's the bandit part of the title) and they marry! It's not clear when—or if!—she falls in love with him, but let's hope that she does. The film is included on a DVD entitled Othello.